Talk about a world traveler! 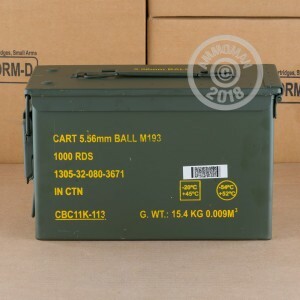 This ammo was produced by Magtech's parent company, CBC, in Brazil about 7 years ago for the Singapore Armed Services (SAS). 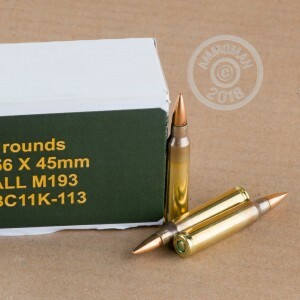 The SAS has since decided to sell back some of the ammo at a discount to Magtech, so that means you get 5.56x45mm ammunition at a discount too! 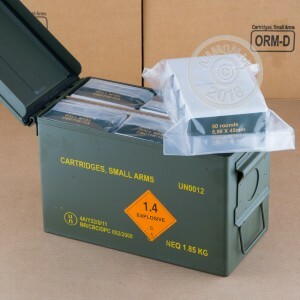 Fresh packed in 1000 round M2A1 (50 cal) metal ammo cans with desiccant, these rounds are in great condition and function awesome! If you're itching to get your AR-15 out to the range with some tried and true 5.56x45mm ammo, then get you a can of this stuff today! Once this ammo is gone, it's gone! Order ammo and used 800 rounds for class. Superb performance. No issues. Superb performance. No feeding or other issues. Arrived super fast. Ordered on Tuesday and arrived on Friday. This ammo is excellent. Packaging was sealed and I was extremely please with delivered ammo. Thank you Eric!